Cut off the tip of each grape so it can sit cut side down. Push one toothpick into each grape, working quickly so the grapes stay frozen. Before dipping each grape into the yogurt, wipe off the frost on the grapes with paper towel. Doing so will help the yogurt better stick to the grapes. After dipping a grape in yogurt, quickly dip the bottom of the grape in a bowl of ground hazelnuts. Set the dipped grape onto a pan lined with a sheet of wax paper/parchment. Finish rest of the grapes in the same way. Return to freezer for one hour prior to serving. Preheat oven to 400°F. Place blueberries on a large baking sheet. Pour two tablespoons of fresh lemon juice and 1 tablespoon of honey over blueberries. Gently toss. Roast for 7-10 minutes until they are soft. Let cool at room temperature. In a small bowl, combine the ricotta cheese, remaining lemon juice, and one tablespoon lemon zest. Spread over the baguette slices. Add the blueberries on top of the cheese. Drizzle each baguette with honey and serve. Makes 4 snack-size or 2 meal-size servings. Gently slice pita in half and separate into two rounds. Place pita rounds on a baking sheet (insides up) and brush with one tablespoon olive oil. Crumble and scatter goat cheese onto the pita halves, leaving a little border of naked pita around the edges, then nestle grapes on top of, and around, the crumbled goat cheese. Bake pita pizzas for 10 minutes, or until the cheese is warm and pita is crisp. In a small bowl or little jar, whisk together 1 tablespoon olive oil, lemon juice, and maple syrup. Sprinkle fresh mint leaves on top of the cooked pizzas, and drizzle with some of the maple-lemon dressing. Choose a sweet, prepared base or make your own. To make the base, combine the flour and sugar and add enough milk to make a soft dough. Pat out on a lightly greased oven tray (sheet) to form an 18-20cm (7 – 8") circle. Flute the edges if desired. Brush with the melted butter or margarine and bake for about 12 minutes, until golden and cooked. Peel and slice the kiwifruit. Mash one gold kiwifruit and combine with the cream cheese. Spread over the cooled pizza base. Top with slices of the remaining fruit, filling the center with strawberries or grapes. Sprinkle with nuts. The pizza can be briefly grilled and served warm if desired. Alternatively, serve it at room temperature. Excellent served with yogurt or ice cream. Place all ingredients in a food processor. Process until as smooth as possible. Stop the machine and scrape down the sides 4-5 times. If the mixture gets too thick to process, add a little water, one tablespoon at a time. You can serve immediately or scoop out individual scoops on a baking tray and freeze until ready to use. Preheat oven to 375°F (190ºC). Puree mayonnaise, garlic and orange juice until blended. Stir in orange peel; set aside. Whisk eggs, milk, Grand Marnier and cinnamon until blended. Dip 4 slices bread into the egg-mixture, coating both sides. Spread 1 ½ teaspoons mayonnaise mixture on one side of each bread slice. Layer Havarti and turkey. Dip 4 more slices bread into egg-mixture; place on top of turkey slices. Spread 1 ½ teaspoons mayonnaise mixture on top of each bread slice; top with Mozzarella and kiwifruit slices. Dip last 4 slices bread into egg-mixture and place on top of kiwifruit slices. Secure sandwiches with long toothpicks. Melt butter in 13x9x2-inch (33x23x5 cm) pan. Place sandwiches on butter. Bake at 375°F (190ºC) for 30 minutes, turning once until golden brown. Cut each sandwich in half diagonally, sprinkle with powdered sugar and serve. Place baguette slices on a large baking sheet and brush each side of the bread slices with extra virgin olive oil. Toast bread in the hot oven for 5 minutes, flip and bake another 5 minutes, or until the slices are golden brown. In the meantime, warm 2 teaspoons of olive oil in a large skillet over medium-low heat. Add grapes to the pan and toss them to coat in the warm oil, cooking gently for 1-2 minutes. You want the grapes just warmed through, but still firm. Add one teaspoon of balsamic to the grapes. Divide each slice of prosciutto lengthwise into two pieces. Blot Burrata with a paper towel to remove any excess water. Place toasted baguette slices on a serving tray. Top each slice with a small scoop of Burrata and a glistening grape or two wrapped loosely in prosciutto. Top each crostini with freshly ground black pepper and a basil leaf. Drizzle on a little more balsamic, if desired. Heat a medium saucepan over medium heat. Add quinoa and toast the grains, stirring regularly for 3-5 minutes until you smell the toasted aroma. Then add 2 cups of water and 1/2 teaspoon salt to the pot and turn the heat to high. When the liquid comes to a boil, cover and turn the heat to low, letting the quinoa simmer gently (covered) for 14-16 minutes, until tender. Fluff quinoa with a fork and transfer the warm grains to a low wide bowl or serving dish. Let the quinoa cool while you prep the other ingredients. Prepare your dressing by combining: shallot, 1/2 teaspoon salt, lemon juice, and olive oil. Toss room temperature quinoa, grape halves, toasted pecans, celery, watercress and the dressing. Add additional salt and black pepper to taste. Spread butter on one sides of each of the sliced bread. 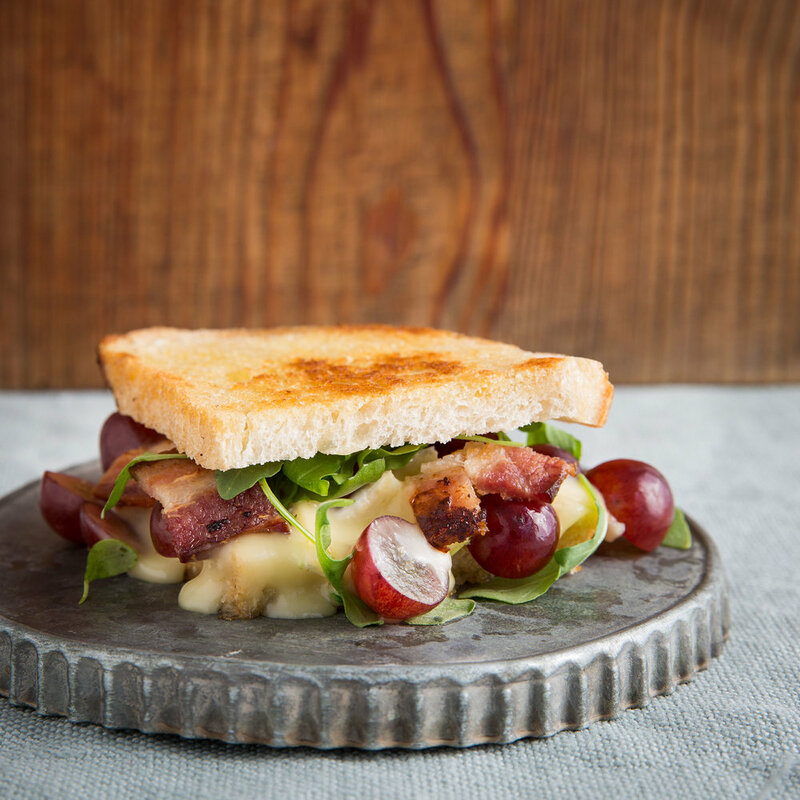 Layer the un-buttered sides of 4 of the bread slices with equal amounts of Brie, chopped bacon, grapes and arugula. Top with remaining bread slices, buttered sides up. Cook sandwiches on a griddle until Brie has melted and the bread is golden brown on each side.